Enterprises choose an established platform like Python which not only frees them from their various constraints but brings them a number of business benefits as well. It has replaced languages such as Java and has become the most popular language among professionals. Many popular developer communities including Stack Overflow and Codecademy prove that the rise of Python is major. Python Training is one of the most sought-after training programs in the entire programming domain. As a programming language, Python is easy and simple to learn. Its simple to read syntax and easy compilation feature cuts development time in half. It also has plenty of libraries that support data analysis, manipulation and visualization. Python has come a long way and is considered to be the next big thing for professionals. It has been found to be the most popular language for Data Scientists worldwide. 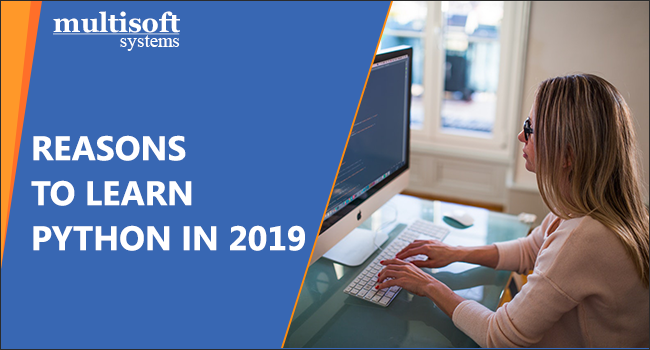 Python is finding its application in diverse domains, like Big Data, Smart Devices, Game Development, AI, Web Testing, Web Development & Frameworks, etc. Getting trained in this programming language will make you eligible for faster programming and lucrative global careers. Some of the high paying Python job profiles are Software Engineer, Python Developer, Research Analyst, Data Analyst, Data Scientist, and Software Developer. According to Indeed, at least 55,000 Python jobs are identified in the US with exponential salary figures. On an average, Python professionals earn very good, ranging from 70,000 USD to 150,000 USD depending upon their experience, location, and domain. Almost 41 large organizations in the world have adopted Python as their primary programming language in a very small span of time. Quora, YouTube, SlideShare, Facebook, Dropbox, Pinterest, Netflix, and Reddit have most of their new code written in Python. Also, Google has adopted Python as its secondary coding language. Learning Python will give you the ability to automate trivial stuff, and let you focus on more exciting and useful things. Majority of the professionals are learning Python to make a career in Data Science due to the exciting work and high pay. It also offers so many libraries and frameworks such as Django and Flask which makes web development really easy. It is so easy to find solution to any Python related problem in minutes because of the large online community. Learning Python means you can do almost everything. You will be able to create your web applications and do data analysis using NumPy, Scipy, Scikit-learn, and NLTK. Multisoft Systems offers the best Python Training in Noida for professionals from diversified domains. They are known for their devotion and loyalty to their students. Their training courses are customized according to your learning needs and requirements. They enlist only certified trainers who have extensive knowledge of the subject. The Python Training program is suitable for anyone who has working experience on any programming language and possess strong interest in exploring different programming languages.